Since its premiere at the 2012 Jeonju International Film Festival, Sleepless Night (잠 못 드는 밤) has gone on to feature in several high profile festivals on a number of continents, garnering awards both at home and abroad. 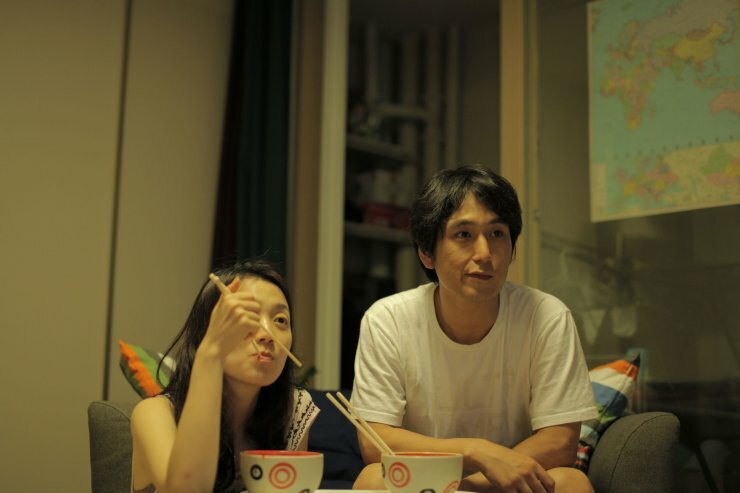 Director Jang Kun-jae’s (장건재) film, about a couple who explore the possibility of starting a family two years into their marriage, thoroughly deserves such accolades as he has produced an incredibly charming and heartwarming drama. The no-frills approach employed in director Jang’s insightful exploration conveys palpable realism, while the performances by Kim Su-hyeon (김수현) and Kim Joo-ryeong (김주령) as husband and wife Hyeon-soo and Joo-hee are beautifully sincere and poignant. The editing, as well as lack of a traditional sense of resolution, detract from the impact of the film somewhat yet despite this Sleepless Night is a truly touching independent feature and a highly refreshing viewing experience. Married for two years, Hyeon-soo and Joo-hee are still deeply in love. Their devotion to each other is conveyed through small, subtle actions like riding waiting for each other after work, washing one another in the shower, and longing stares while sleeping. The love between them is wonderfully profound and uplifting, and conveyed with stunning sincerity by the lead actors who never for an instant appear lacking in commitment. Director Jang examines their thoughts regarding starting a family through the couples daily routines and activities, portraying their evolving feelings on the subject as born naturally through the confrontations that transpire, promoting the believability of the situation. Financial and employment worries as the couple struggle to make ends meet, as well as pressure from parents and discussions with friends, also factor into the decision making process that lend credibility to their anxieties despite their clear love for each other. The apprehension and worry that such encounters generate leads to the titular ‘sleepless night’, whereby Hyeon-soo and Joo-hee experience their worst fears through bad dreams. Director Jang does a wonderful job of seamlessly placing the deep-rooted psychological fears within the narrative, as well as insightfully portraying how each has interpreted different concerns over their prospective future. In fact, due to the rather unrefined editing within Sleepless Night, it is initially difficult to ascertain that such scenes were dreams at all, with the confusion created an unwelcome distraction from otherwise interesting sequences. Due to the inherent realism and the nature of the narrative, the notion of a traditional ‘arc’ has been rejected. This method is particularly refreshing, as contrivances and ill-fitting events don’t makes their presences known and the film is all the stronger for it. The development of the protagonists is subtle and gentle, and therein lies the charisma as the personal issues are allowed to shine and develop naturally. However, perhaps due to conditioning from prior dramas, the lack of some form of resolution to their situation is a little unsatisfactory. Yet the superb acting by both Kim Joo-ryeong and Kim Su-hyeon is so compelling and alluring throughout that Sleepless Night is, despite the absence of resolution, an uplifting and illuminating experience. Sleepless Night (잠 못 드는 밤) is a beautifully understated, wonderfully compelling independent drama about a couple discussing the daunting subject of starting a family. Director Jang Kun-jae (장건재) has produced an insightful exploration of the issue, while his no-frills approach conveys palpable realism and sincerity. Lead actors Kim Joo-ryeong and Kim Su-hyeon provide superb, heartfelt performances throughout. While the editing is somewhat unrefined, Sleepless Night is a charismatic film deserving of its accolades.